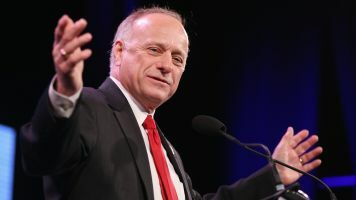 Rep. Steve King of Iowa drew criticism from his colleagues on both sides of the aisle. Iowa Republican Rep. Steve King is standing by something he tweeted Sunday. He wrote, "Wilders understands that culture and demographics are our destiny. We can't restore our civilization with somebody else's babies." King was referring to Dutch politician Geert Wilders, who is the leader of the far-right Party for Freedom. Wilders is known for his own controversial comments and was even convicted in December of inciting discrimination. The Netherlands will hold its general election Wednesday — and Wilders has a shot at becoming prime minister if his party wins. In an interview with CNN Monday, King — an eight-term congressman — said he's shared the same message with European leaders for the past decade: Improve your country's birthrate to rebuild your civilization. "You've got to keep your birthrate up and that you need to teach your children your values, and in doing so then you can grow your population and you can strengthen your culture. You can strengthen your way of life," King said. King offered a definition for what he meant by "somebody else's babies." "... that's that push to bring in much illegal immigration into America, living in enclaves, refusing to assimilate into the American culture and civilization. Some embrace it, yes. but many are two and three generations living in enclaves that are pushing back now and resisting against assimilation," he told CNN's Chris Cuomo. King called himself "a champion for Western civilization," which he said is "a superior civilization." "You're either a — Muslim-American, an Italian-American, an Irish-Scotch-German-American is what your roots are. Either those are all equal things or they are not. What is your answer?" Cuomo asked King. King replied, "They contribute differently to our culture and civilization. There are moderate Muslims that are equal to in all these categories that you describe." "I said a Muslim-American — " Cuomo said. "There are others, Chris — " King said. "People that have lived here who are assimilated," Cuomo said. "There are others who are teaching hatred in their families," King said. white — " Cuomo said. "If they are assimilated, that's what we want. I think they can assimilate," King said. King's tweet and his subsequent comments on CNN didn't sit well with his colleagues on either side of the aisle. But he's no stranger to that, as he's previously made controversial comments. "Where did any other subgroup of people contribute more to civilization?" he said on MSNBC ahead of the Republican National Convention last summer. "Than white people?" MSNBC's Chris Hayes asked. "Than western civilization itself that's rooted in Western Europe, Eastern Europe and the United States of America and every place where the footprint of Christianity — " he said. "What about Africa?" April Ryan interjected. "— settled the world," King said. "What about Asia?" Ryan asked. And when discussing a path to citizenship for immigrants brought to the U.S. illegally when they were children, King told NewsMax, "For everyone who's a valedictorian, there's another 100 out there who weigh 130 pounds — and they've got calves the size of cantaloupes because they're hauling 75 pounds of marijuana across the desert."